Who are the Amish? Are they the same as the Pennsylvania Dutch? What is the history of the Amish? The Amish seem stuck in history. Why don't they accept modern ideas and innovations? 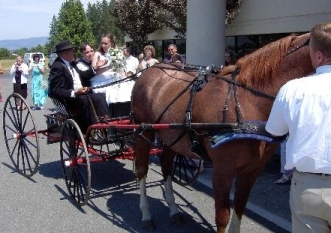 What's an Amish wedding like? Do Amish children go to school? The Amish are a religious group who live in settlements in 22 states and Ontario, Canada. The oldest group of Old Order Amish, about 16-18,000 people live in Lancaster County, Pennsylvania. The Amish stress humility, family and community, and separation from the world. 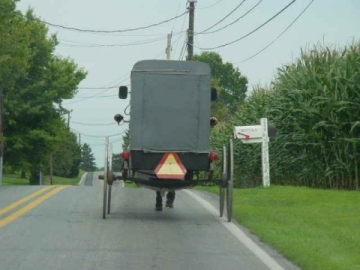 Although Lancaster Amish are Pennsylvania Dutch, all Pennsylvania Dutch are not Amish. The Pennsylvania Dutch are natives of Central Pennsylvania, particularly Lancaster and its surrounding counties. Unlike the Amish, they are not all one religion. Instead, their common bond is a mainly German background Pennsylvania Dutch is actually Pennsylvania Deutsch, or German. They also have Welsh, English, Scottish, Swiss, and French ancestry. The Amish have their roots in the Mennonite community. Both were part of the early Anabaptist movement in Europe, which took place at the time of the Reformation. The Anabaptists believed that only adults who had confessed their faith should be baptized, and that they should remain separate from the larger society. Many early Anabaptists were put to death as heretics by both Catholics and Protestants, and many others fled to the mountains of Switzerland and southern Germany. Here began the Amish tradition of farming and holding their worship services in homes rather than churches. In 1536, a young Catholic priest from Holland named Menno Simons joined the Anabaptist movement. His writings and leadership united many of the Anabaptist groups, who were nicknamed "Mennonites." In 1693, a Swiss bishop named Jacob Amman broke from the Mennonite church. His followers were called the "Amish." Although the two groups have split several times, the Amish and Mennonite churches still share the same beliefs concerning baptism, non-resistance, and basic Bible doctrines. They differ in matters of dress, technology, language, form of worship, and interpretation of the Bible. The Amish and Mennonites both settled in Pennsylvania as part of William Penn's "holy experiment" of religious tolerance. The first sizable group of Amish arrived in Lancaster County in the 1720's or 1730's. Although the Amish look like they stepped out of the rural nineteenth century, in fact they do change. Their lives move more slowly than ours, but they definitely are not stuck anywhere. They choose to examine change carefully before they accept it. If the new idea or gadget does not assist in keeping their lives simple and their families together, they probably will reject it. Each church district decides for itself what it will and will not accept; there is no single governing body for the entire Old Order population, but all follow a literal interpretation of the Bible and an unwritten set of rules called the Ordnung. Old Order groups all drive horses and buggies rather than cars, do not have electricity in their homes, and send their children to private, one-room schoolhouses. Children attend only through the eighth grade. After that, they work on their family's farm or business until they marry. The Amish feel that their children do not need more formal education than this. Although they pay school taxes, the Amish have fought to keep their children out of public schools. In 1972, the Supreme Court handed down a landmark unanimous decision which exempted the Old Order Amish and related groups from state compulsory attendance laws beyond the eighth grade. Many Mennonites and progressive Amish do attend high school and even college. Most Amish are trilingual. They speak a dialect of German called Pennsylvania Dutch at home; they use High German at their worship services; and they learn English at school. They speak English when they deal with anyone who is not Amish. They pronounce Amish with a broad "a" Ah-mish. 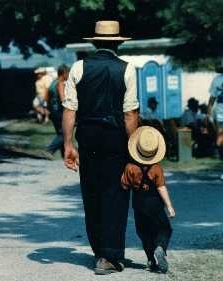 The Amish are a private people who believe God has kept them together despite pressure to change from the modern world. They are not perfect, but they are a strong example of a community that supports and cares for its members. They are a people apart; they are also a people together. Old Order Amish women and girls wear modest dresses made from solid-colored fabric with long sleeves and a full skirt not shorter than half-way between knee and floor. These dresses are covered with a cape and apron and are fastened with straight pins or snaps. They never cut their hair, which they wear in a bun on the back of the head. On their heads they wear a white prayer covering if they are married and a black one if they are single. Amish women do not wear jewelry. Men and boys wear dark-colored suits, straight-cut coats without lapels, broad fall trousers, suspenders, solid-colored shirts, black socks and shoes, and black or straw broad-brimmed hats. Their shirts fasten with conventional buttons, but their suit coats and vests fasten with hooks and eyes. They do not have mustaches, but they grow beards after they marry. The Amish feel these distinctive clothes encourage humility and separation from the world. Their clothing is not a costume; it is an expression of their faith. Family is the core element in the Amish church, and choosing a mate is the most important decision in an Amish man's life. Boys and girls begin their search for a spouse when they turn sixteen. By the time a young woman turns twenty or a young man is in his early twenties, he or she is probably looking forward to the wedding day. But several definite steps must be taken by a couple before they may marry. Both must join the Amish church. 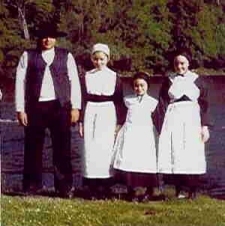 They are baptized into the Amish faith and are responsible for following the Ordnung. The Ordnung is a written and unwritten set of rules for daily living. Joining the church prepares the young people for the seriousness of setting up their own home. The young man asks his girl to marry him, but he does not give her a diamond. He may give her china or a clock. The couple keeps their intentions secret until July or August. At this time the young woman tells her family about her plans to marry. A whirlwind of activity begins after Fast Day on October 11. Fall communion takes place the following church Sunday. After communion, proper certification of membership is requested, and is given by the second Sunday after communion. This is a major day in the life of the church because all the couples who plan to marry are "published." At the end of the service, the deacon announces the names of the girls and who they plan to marry. The fathers then announce the date and time of the wedding and invite the members to attend. The betrothed couple does not attend the church service on the Sunday they are published. Instead, the young woman prepares a meal for her fiance and they enjoy dinner alone at her home. When the girl's family returns from church, the daughter formally introduces her fiance to her parents. After being published, the young people have just a few days before the ceremony. They are permitted to go to one last singing with their old group of friends. The girl also helps her mother prepare for the wedding and feast which takes place in her parents' home. The boy is busy extending personal invitations to members of his church district. And the bride wore...blue. Blue may not be the most traditional color for a bridal gown, but in one instance it is actually the most popular color choice. Blue is a typical color chosen for weddings by young Amish women. Navy blue, sky blue and shades of purple are the most popular colors donning Amish brides in any year. An Amish bride's wedding attire is always new. She usually makes her own dress and also those of her attendants, known as newehockers, Pennsylvania Dutch for side sitters. The style of the dresses are a plain cut and are mid-calf length. They are unadorned, there is no fancy trim or lace and there is never a train. Most non-Amish brides wear their bridal dress once, but an Amish bride's practical dress will serve her for more than just her wedding day. Her wedding outfit will become her Sunday church attire after she is married. She will also be buried in the same dress when she dies. The bride and her attendants also wear capes and aprons over their dresses. Instead of a veil, the bride wears a black prayer covering to differentiate from the white cap she wears daily. And, the bride must wear black high-topped shoes. No one in the bridal party carries flowers. The groom and his newehockers wear black suits. All coats and vests fasten with hooks and eyes, not buttons. Their shirts are white, and shoes and stockings are black. Normally, Amish men do not wear ties, but for the wedding they will don bow ties. The groom also wears high-topped black shoes, and a black hat with a three and a half inch brim. All of the attendants in the wedding party play a vital role in the events of the day. But there is no best man or maid of honor; all are of equal importance. Wedding dates for the Amish are limited to November and part of December, when the harvest has been completed and severe winter weather has not yet arrived. A full day is needed to prepare for the wedding. Most are held on Tuesdays and Thursdays. Mondays, Wednesdays and Fridays are used as days to prepare for or to clean-up after. Saturdays are not used as wedding days because it would be sacrilegious to work or clean-up on the following day, Sunday. A typical Amish wedding day begins at 4 o'clock in the morning. After all, the cows must still be milked and all the other daily farm chores need to be done. There are also many last minute preparations to take care of before the wedding guests arrive. Helpers begin to arrive by 6:30 a.m. to take care of last minute details. By 7:00 a.m., the people in the wedding party have usually eaten breakfast, changed into their wedding clothes, and are waiting in the kitchen to greet the guests. Some 200 to 400 relatives, friends and church members are invited to the ceremony, which is held in the bride's home. The Forgeher, or ushers, usually four married couples, will make sure each guest has a place on one of the long wooden benches in the meeting or church room of the home. At 8:30 a.m., the three-hour long service begins. The congregation will sing hymns, without instrumental accompaniment, while the minister counsels the bride and groom in another part of the house. After the minister and the young couple return to the church room, a prayer, Scripture reading and sermon takes place. Typically, the sermon is a very long one. After the sermon is concluded, the minister asks the bride and groom to step forward from their seat with the rest of the congregation. Then he questions them about their marriage to be, which is similar to taking wedding vows. The minister then blesses the couple. After the blessing, other ordained men and the fathers of the couple may give testimony about marriage to the congregation. A final prayer draws the ceremony to a close. That's when the festivities begin. In a flurry of activity, the women rush to the kitchen to get ready to serve dinner while the men set up tables in a U-shape around the walls of the living room. A corner of the table will be reserved for the bride and groom and the bridal party. This is an honored place called the "Eck," meaning corner. The tables are set at least twice during the meal, depending on how many guests were invited. The tables are laden with the "roast," roast chicken with bread stuffing, mashed potatoes, gravy, creamed celery, coleslaw, applesauce, cherry pie, donuts, fruit salad, tapioca pudding and bread, butter and jelly. The bride sits on the groom's left, in the corner, the same way they will sit as man and wife in their buggy. The single women sit on the same side as the bride and the single men on that of the groom. The immediate family members sit at a long table in the kitchen, with both fathers seated at the head. After dinner, the afternoon is spent visiting, playing games and matchmaking. Sometimes the bride will match unmarried boys and girls, who are over 16 years old, to sit together at the evening meal. The evening meal starts at 5:00 p.m. The parents of the bride and groom, and the older guests are now seated at the main table and are the first to be served. The supper varies from the traditional noon meal. A typical menu might consist of stewed chicken, fried sweet potatoes, macaroni and cheese, peas, cold-cuts, pumpkin and lemon sponge pies, and cookies. The day usually winds to a close around 10:30 p.m. The couple's first night together is spent at the bride's home because they must get up early the next day to help clean the house. Their honeymoon is spent visiting all their new relatives on the weekends throughout the winter months ahead. This is when they collect the majority of their wedding gifts. Usually, they receive useful items such as dishware, cookware, canned food, tools and household items. Typically, when the newlyweds go visiting, they will go to one place Friday night and stay overnight for breakfast the following day. They'll visit a second place in the afternoon and stay for the noon meal and go to a third place for supper. Saturday night is spent at a fourth place, where they have Sunday breakfast. A fifth place is visited for Sunday dinner and a sixth for Sunday supper before they return to the bride's parents home. The couple lives at the home of the bride's parents until they can set up their own home the following spring. Yes...for the many Old Order Amish and Old Order Mennonite children living in Lancaster County, Pennsylvania, the ringing school bell signals a time to shift attention from field work to school work, a time to drop the hoe and pick up a pencil. Old Order children attend one-room schools through the eighth grade and are usually taught by a young, unmarried Christian woman. As a result of the County's growing Old Order population, enrollment in their one-room schools is surging. During recent years Old Order leaders have been over-seeing the construction of new one-room school buildings at the rate of about five per year. A 1972 Supreme Court ruling exempted the Old Order sects from compulsory attendance laws beyond the eighth grade. The one-room schools restrict worldly influences and stress the basics such as reading, writing and arithmetic. The importance of the community and cooperation among its members are also emphasized. Copyright © by Amish Video All rights reserved.